Here at Atlantic Filter Corporation we stay committed to helping you love your tap water. That is why we are proud to announce a new, first of its kind whole-house water system certified for lead and cyst removal. Now introducing, the PIONEER™ from ENPRESS, LLC. According to a recent report by CNN and information they obtained from multiple sources and water experts, eighteen million Americans live in communities where the water systems are in violation of drinking water standards. Often symptoms of lead poisoning like low iron deficiencies, head and stomach aches, and tiredness are misdiagnosed as other illnesses. Lead poisoning in children can cause them to have hyperactivity, slow growth, hearing loss, as well as learning and behavioral problems. The American Academy of Pediatrics says with no effective medical treatments for lead poisoning, the prevention of exposure is needed. As of 1986 when they were banned, lead-based products were used in more than 70% of cities in the United States for conveying water. Lead pipe was less expensive and more durable than iron. It was also easily bendable, making it a viable option for conforming to the contours of existing buildings and other structures. Over the years, water chemistry and physical disturbances have played a significant role in the deterioration of the lead water supply lines, allowing lead to be released into our water supplies. For example, water with high acidity (low pH) and a lack of mineral content can corrode pipes and fixtures. Due to the extensive network of distribution lines, it would take a great deal of time for local governments to replace the existing lead pipe. Therefore, a point-of-entry whole-house water system capable of removing lead is the ideal solution for protecting your family. It is important to remember, when it comes to lead, there is no safe level for the human body. Low concentrations of the colorless, odorless, and tasteless metal can cause irreversible damage due to a significant increase in blood lead levels. Also a potent neurotoxin, lead has significant effects on a child’s health and development. Exposure can affect almost every system in a child’s body, impeding both their physical and mental development. Specifically designed to remove both soluble and particulate lead from drinking water, PIONEER™ has a 0.5-micron nominal filtration level. This level of filtration removes the invisible, odorless, and tasteless soluble lead chemically while physically removing the particulate lead which has the appearance of a tiny grain of sand. Soluble/Ionic lead: PIONEER™ binders chemically react with soluble lead creating an ionic bond, removing lead from the water kinetically. Particulate lead: PIONEER™ has a specifically engineered filter that physically removes and filters lead particles from the water which, most often, are a result of lead pipe corrosion. PIONEER™ is capable of removing more than just lead; it can remove and/or reduce chlorine, chloramine and other harmful contaminants found in municipal water supplies, including more than 99.95% of Cysts. Microbial Cysts like Giardia and Cryptosporidium can be resistant to disinfectants like chlorine and live in cold water for several months. These Cysts must be filtered from the water supply before entering your home. 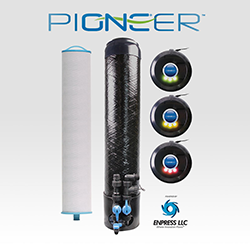 PIONEER™ has a Real-time Dynamic LED System that monitors water and flow rate, providing a visual color-coded notification, letting you know when your filter needs to be replaced. Utilizing state-of-the-art snap-ring technology, PIONEER™ eliminates the need for large tools and makes filter changes easier than ever before, eliminating the need for a service call. Is PIONEER™ Right For You? In older areas and homes, PIONEER™ is currently the best option for protection from lead contamination. To find out if a PIONEER™ whole-house lead and cyst removal system is right for you or to get a free quote, call Atlantic Filter Corporation in West Palm Beach, Florida at (561) 683-0101. For more information on PIONEER™, CLICK HERE.